Welcome to Dave's Whisky Reviews! 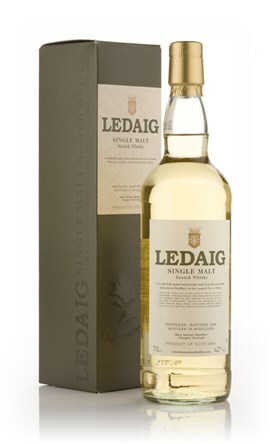 Today we've got a Ledaig, which is peated Tobermory don't you know. Really interesting distillery, it's closed more than open! Rumours are this is 4 years old. I thought this was a supermarket exclusive but some say not. Mystery aplenty! My Fiancé's Uncle bought a bottle to a party because he didn't like it, so I had quite a few drams of this to make sure I had my notes right. It's surprisingly good considering it cost about £18 a bottle. Nose: Very malty with light peat. Buttery, olive oil, salty fish oil, sea spray, lots of butter on toast, malt, smouldering straw and hay embers, roasted chestnut, barley sugar, light fruity hints- Lemon curd. Taste: Quite sharp and fresh with citrus notes- Sharp apple and lemon sherbet, vanilla, hay and grass, butter, sea salt, oily pepper. Developing spice and coastal peat (a little rough) with earthy charred oak, some bitter lemon juice. Finish: Medium length. Drying maltiness to the last with some oily pepper. Quite savoury, really strong aroma of butter on toast. This was my first experience of Ledaig and really opened my eyes to what this distillery can produce despite a disappointing experience with Tobermory 15.